I was invited to the much happening event of IAMAI. Where Suresh Prabhu, Minister of Commerce and Industry brought into our notice that India is now expected to become a 5 trillion dollar economy in the next 8-9 years with the best manufacturing sector alone granting 20 percent to that. 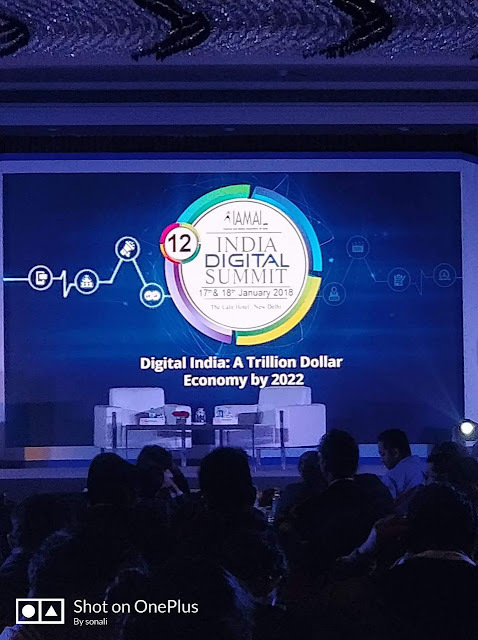 He spoke at the 12th India Digital Summit, organized by the Internet and Mobile Association of India (IAMAI), he said, we are preparing a brief plan what will be going in that assemble. Also Expected Availability of very low cost and a very high-speed mobile Internet connection in 2017 moved a slow speed nation to a high-speed nation. He also conveyed that India will not just be a unicorn but will be profitable for sure in near future. The Internet and Mobile Association of India announced the 8th Digital Awards on January 18 at The Lalit, New Delhi. The Gold, Silver, and Bronze awards for the category Agency of the Year went to Interactive Avenues, iProspect India, and Utopeia Communicationz, respectively. Digital Person of the Year went to the National Payments Corporation of India and the Digital Start-up of the Year went to Unacademy, while Social Media Person of the Year went to Virendra Sehwag. Some of the categories under which the India Digital Awards 2018 were awarded by IAMAI were Cyber Security, Digital Advertising, Digital Content, Digital Social & Economic Empowerment, Mobile & App, Payment & Fintech, Technology and Special Awards. More names of the winners who have begun the year on an astounding note with their respective dedicated outings at the India Digital Awards 2018 and the India Digital Summit. *Isobar India and Affle won the award Best Brand Awareness Campaign Using Mobile for their work with Mondelez India.